Minneapolis, St. Paul and Sault Ste. Marie Railroad (Soo Line) business car “Oak Park” was built by the Barney & Smith Car Co. of Dayton, Ohio in 1884. The car was constructed for the Wisconsin Central as a 31-seat cafe-parlor car and named “Oak Park.” The “Oak Park” and two sister cars, the “Emerald” and “Cedar Lake,” operated as 1st class cars. 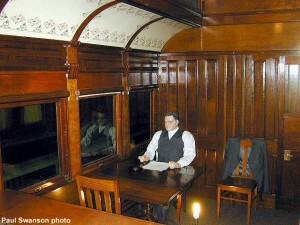 As a cafe-parlor car, the “Oak Park” had smoking rooms at both ends and parlor car seating in a center room. A small kitchen was located near one end of the center room. The interior woodwork featured fine cherry wood trim accented with birds-eye maple veneer. In 1909 the cars were relettered to reflect control by the Minneapolis, St. Paul and Sault Ste. Marie Railroad (Soo Line). The Soo Line subsequently converted the “Oak Park” to a business car for traveling railroad officials. In this configuration the smoking rooms became observation rooms and the central parlor room was remodeled to contain a single large state room, kitchen, and a dining room. In 1929 the name “Oak Park” was dropped and the car became #57. In 1938 the car was again renumbered to W-118 after conversion to a bunk and dining car for work crews. In this capacity the car served for a number of years in Gladstone, Michigan on the wreck train. In 1968 the car was acquired by Mid-Continent and moved to North Freedom. 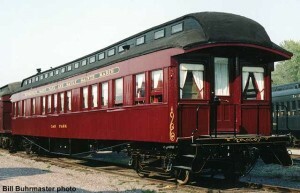 The “Oak Park” was restored to its 1921 era business car appearance. It is in serviceable condition and presently on display in the museum’s Coach Shed. It is used on special occasions for first-class service, as the car was originally intended. The Wisconsin Central Railway was an important Wisconsin railroad extending main routes from Chicago to Minneapolis, Ashland, and Upper Michigan. In 1909 the Wisconsin Central became the property of the Soo Line Railroad. This provided the Soo Line with a Chicago gateway. The present day corporation known as Wisconsin Central Ltd., formed from lines sold by the Soo Line, operates many of the lines of the original Wisconsin Central Railway routes.